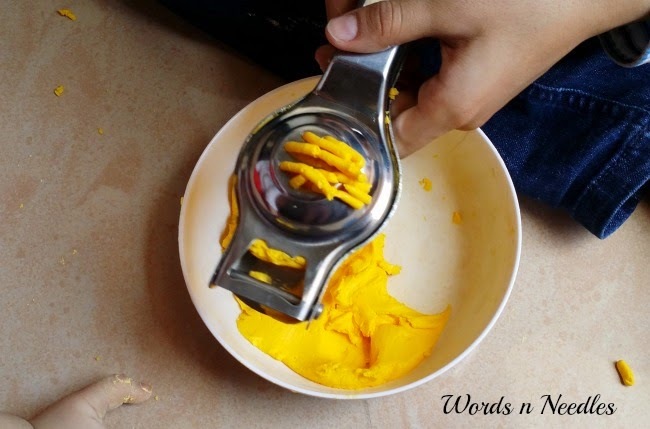 Here is an easy no cook play dough recipe made without cream of tartar. 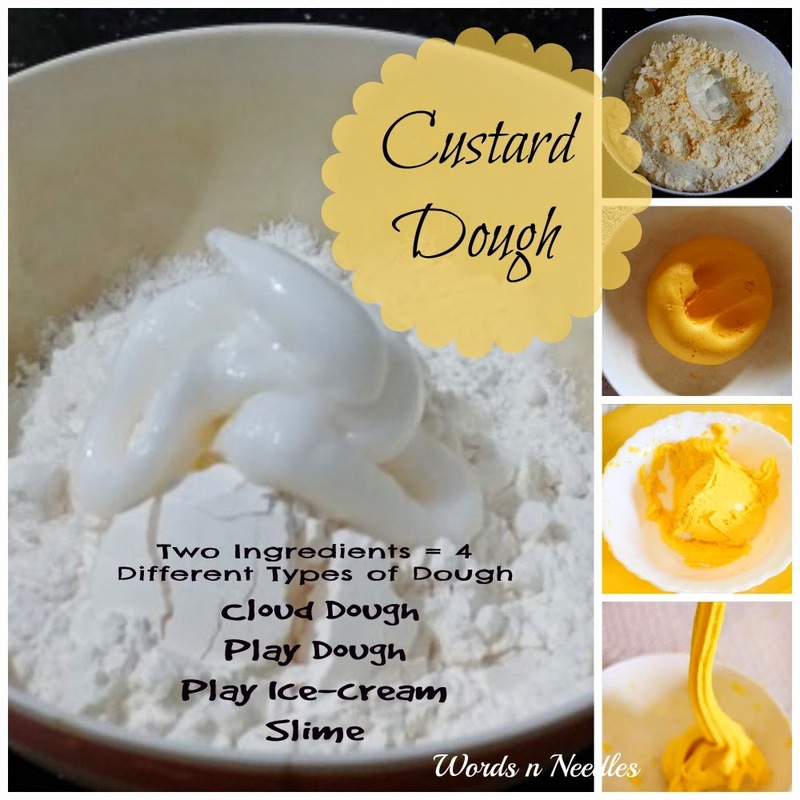 I use this two ingredient no cook playdough recipe with custard powder to make cloud dough and slime too. It is easy enough for even kids to make by themselves. We love experimenting with play dough! This time we used Custard powder and conditioner in our no cook recipe. 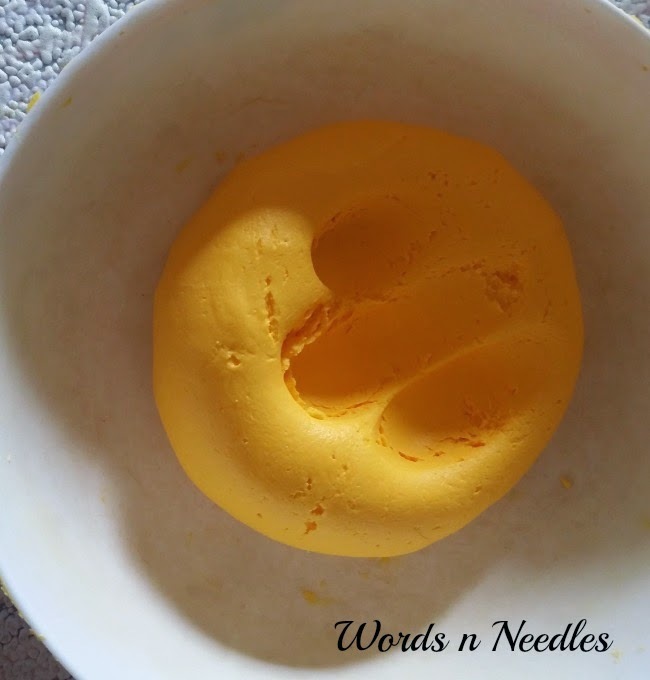 This recipe with just a little variation can make four different types of play dough- Cloud dough, Ice cream dough, silky soft play dough and slime or oobleck! The best part: It is a just a two ingredient playdough! We are on our vacation in India and our little one has been showing her anxious behaviour again. I know how a little sensory play always helps her calm down. Since I have different aged children at home these days, I needed something that all of them could play with. We have children aged 11yrs to as young as 8 months old right now. The play dough that I made was for our 7 yr old and 2 yr old who could play with their 4 yr old, 2 and half year old and 9 yr old cousins. This is what we came up with. Please note: This play dough is not edible. It should be part of supervised play. My 2 yr old is quite mature and she has been taught that play dough is not for eating. I always play with them. I recommend that you use your experience and judgement before giving your child this dough. We made four different types of dough with just these two ingredients. You are just varying the ingredients to make the different types. Don’t worry. There is no cooking involved. Please note: Some of the links in this post are affiliate links. That means if you make a purchase through my links, I make a small commission at no extra cost to you. You can read my Disclosure here. Hair Conditioner / hand lotion – quantity depends on type of dough. Measure out the custard powder and slowly start adding the hair conditioner. The Custard Powder that we use is a ready made packed version. We added equal amounts of both ingredients (4 tablespoon full of conditioner for 4 tablespoon full of custard powder). Rub it between your fingers till it is cloud dough consistency. When you clench it into a fist, it should hold. That is it. That is how to make cloud dough with conditioner. 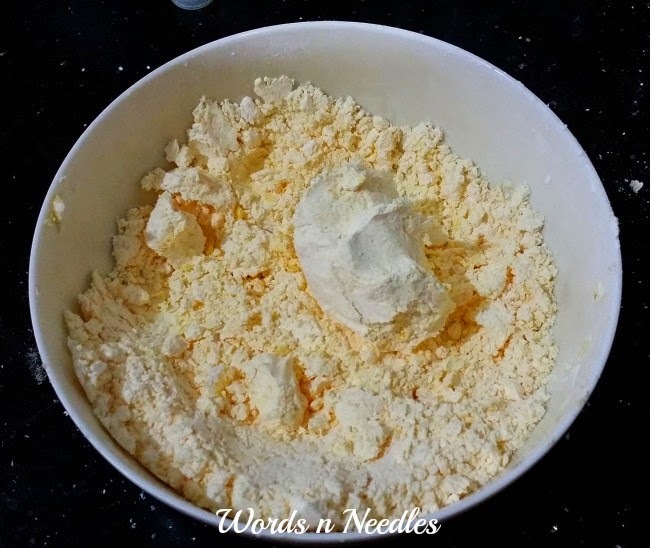 Measure out 4 tablespoon full of custard powder and keep adding conditioner a tablespoon at a time till you have knead it well with your hand. Soft peaks will start forming before you find it slowly becoming sticky. Stop adding the conditioner, knead it well. Store air tight at room temperature. We kept it rolled into a ball in a cling film and then stored it in a air tight tub. Gee… doesn’t this remind you of pumpkins? Umm… mangoes too! Our custard powder turns yellow but there are pink versions in the market too. Alternatively, you can use just cornstarch to make this play dough recipe. Measure out four table spoon of custard powder + Four tablespoon full of conditioner. Mix well till it looks like Cloud dough (See above). Add a tablespoon or so of water till it comes together and becomes dough like consistency. You will have to knead it well. It will come away from the sides and cease to be sticky when it is done. 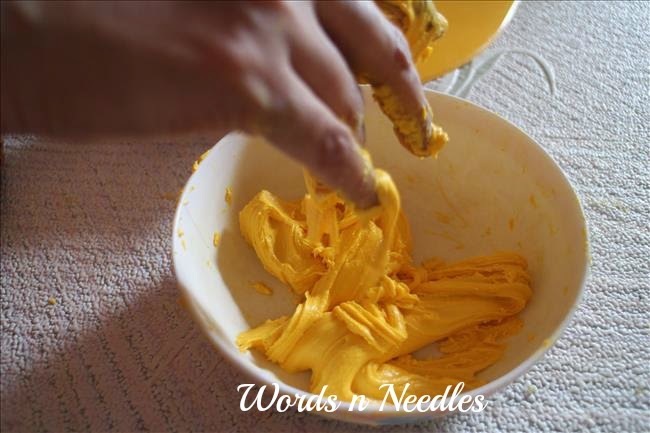 The method to make slime from condioner and custard powder is same as the Silky Soft Play Dough recipe above. Just keep adding water (a little at a time) till it becomes slimy. Almost half a cup of water may be needed. Conditioner+ Custard Powder = Cloud dough / Ice cream dough / Silky Soft Playdough/ slime. Our new favourite tool: lemon press! This no bake no cook play dough recipe is hours of fun. My children enjoyed it thoroughly. I had enough of it in my hair too! I am not going to complain though because it leaves no stains and it washes off easily too. If you have a free afternoon and out of ideas, I highly recommend you let your children/child play with this two ingredients play dough. This slime is a perfect sensory dough for anxious children. My little toddler needs ‘Play Dough Therapy’ from time to time to unwind. This is by far the best playdough recipe we have made. It is just two ingredients! Want more inspirations and activities to do with your little one? 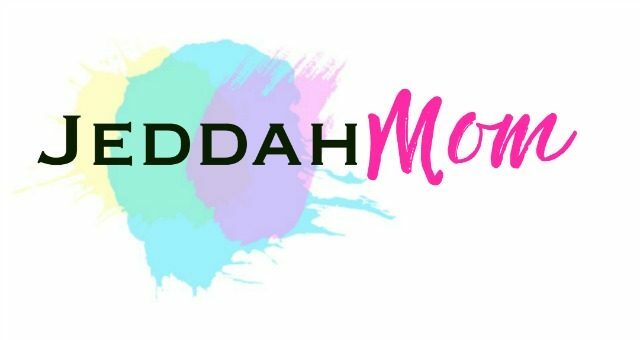 We share lots of child play ideas, crafts, positive parenting tips and hacks all through the day, everyday, on our facebook page. We have lots of fun stuff for you too! 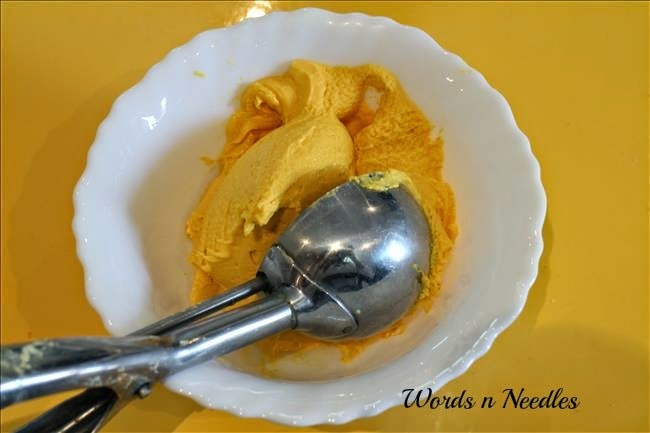 Do visit Words n Needles on Facebook.